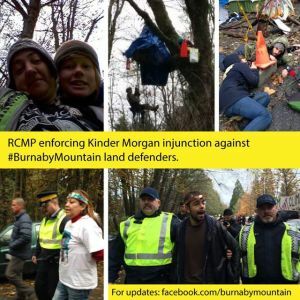 RCMP have arrested at least 24 Burnaby Mountain caretakers and supporters today, as police moved in to remove a long-standing protest presence against Kinder Morgan’s pipeline survey crews. – Tamo Campos, David Suziki’s grandson who has been supporting the site for weeks. Fourteen of those arrested have been released on civil contempt charges, the other ten remain in-custody. Kinder Morgan crews, escorted by RCMP, are currently at the clearing and have begun work. 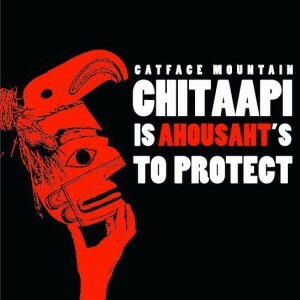 The Burnaby Mountain caretakers are calling for an ongoing presence at the mountain, as well at the RCMP detachment at 6355 Deer Lake Avenue. “We are sending a clear message that the pipeline will not be built on unceded lands without the consent of Indigenous nations and the approval of all those who love these lands,” the group gathered has declared.